With consistent attention to quality and service, R.C.A. 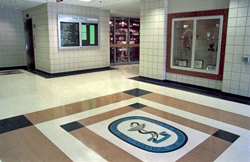 Rubber has been a leader in fabricating sheet rubber transit flooring, entrance plates and step treads since the 1950's. A fourth-generation, American-owned family business, R.C.A. has earned a solid reputation for durable, customer-preferred flooring products.